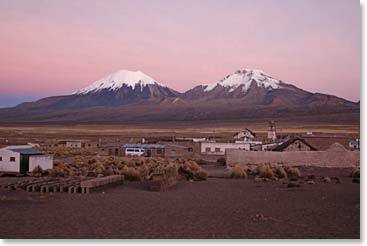 Hello again, this is Trevor Stuart calling from Sajama village near Mount Sajama. 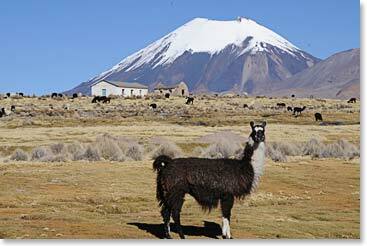 We departed La Paz this morning at about 9:30 sharp and we drove and drove. We stopped at a place along the highway where there were ancient tombs above ground where you could actually look inside them and see skulls and bones. It was really incredible. They are over 400 years old. So Osvaldo, our guide, decided we would stop here and set up our tables. Maria prepared lunch for everybody. Just being in that ancient part of Bolivia, just being in that culture just seemed to really hit home. It’s an amazing country. Maria cooked up this amazing lunch on the side of the road. There was beef, there was chicken, there was salad and potatoes. It was unbelievable. Go Berg style, if you ever want to go on an adventure. Our guides for Mount Sajama is our famous Osvaldo, Sergio, Alex and Francisco and our cook again is Maria. I just want to say how funny Hugo is and Rafael. They are hilarious and they had Margaret and I in stitches laughing so hard we could hardly even contain ourselves the whole way. They are funny people and we are really meshing as a group. I just wanted to say we are all here and just starting to get into our rooms and set up for the night. I can see Maria is preparing dinner already. She is cooking away. That is it for our update.